The Feminist Coding Collective is premised on the concept that feminist scholars approach coding differently than other researchers. This is a safe space for women-identified, people of color, and gender nonconforming people to learn complex, computational skills. This group will model ways to teach each other to code based on intersectional principles. We aim to develop a curriculum and teaching methods that are rigorous enough that our computing habits are strong, but flexible enough for people of all disciplines and backgrounds. The Feminist Coding Collective is inclusive and open to everyone. Our community is based on tolerance, collaboration, mutual respect, and learning. We strive for continuing to diversify our community and recognize that our current community should be more diverse. We invite all people, whoever you are and whatever your background, to join us. We have created a code of conduct to ensure this diverse community is a safe space where we can learn from each other. We recognize that people may have good intentions, but sometimes our actions affect people differently than we anticipated. The point of having procedures to address disagreements is to foster broader understanding of people different from ourselves. Be respectful: Do not use harmful language or stereotypes that target people of all different gender, abilities, races, ages, ethnicities, languages, socioeconomic classes, body types, sexualities, and other aspects of identity. Online spaces: Respect each other in both physical and digital spaces. Reporting: In order to report harassment or any harmful behaviors, please notify the rotating welfare officers as soon as possible. Rotating Roles: When we take notes, rotate who takes notes each week so we all have the chance to participate in discussions. The welfare officer (two at a time) may also rotate, checking the reporting system and offering to listen to others’ reports and fears. When a welfare officer receives a report, listen to the person’s statement and what this person wants from this conversation. If we are doing any work on the website or other digital spaces, we will rotate these jobs as well. No means no, and only a yes can be yes. Coercion is not consent. Harassment can be defined by the person who has been harassed, so denial of harassment can be considered a form of harassment. Collaborative and inclusive interactions: Avoid speaking over each other. Instead, we want to practice listening to each other and speaking with each other, not at each other. Call people in: “Ouch” as a cue to demonstrate that someone has said something or behaved in a way that stepped over someone else; “oops” is a response cue to “ouch.” Using this cue, we can open up a dialogue for uncomfortable moments. Use “I” statements: focusing on your own interpretation of a situation, rather than placing blame or critiquing someone else. Reporting: If there are particular behaviors that break the code of conduct or you are feeling isolated because you might not be keeping up with certain codes we learn, pull aside someone you trust and talk to them. Consent is key: Ask someone explicitly before you touch their keyboard, screen, computer, and belongings. “Ouch” might be a useful cue if someone does this. Labor: Recognize and discuss those labor practices that digital projects require. Let’s be aware of who is doing what work, how much, and when. Check in: At the beginning of each meeting, we will have a check-in to discuss our experiences with our work and the work we are doing in this group. Bring issues and harmful experiences to the group first to avoid cliquish behavior and encourage communication. This check-in might be a good time to check the reporting system, as well. It’s okay not to know: Assume that no one inherently knows what we’re learning; if you are in the position of workshopping, you also will not know everything and that is okay! Encourage a space where it’s okay to ask questions. Be a megaphone: Be aware of the discursive dynamics. Be sure to address others’ ideas and give credit. Inspired by two recuperative digital archives at Northeastern, the Early Caribbean Digital Archive and the Women Writers Project, this event seeks to revise Wikipedia articles which extend romantic and orientalist representations of colonial history and literature. Our goal is to neutralize the heightened romantic and sentimental language used on Wikipedia to represent historical figures, paying special attention to representations of marginalized persons such as women, free and enslaved people of color, and indigenous persons. We will focus on Wikipedia articles on historical persons, travel narratives, natural histories, captivity narratives, and slave narratives. You can find full information about the event here. We organized two transcribe-a-thon event to help the work of the Colored Conventions Project. You can find more information on that project here: http://coloredconventions.org. Take a cue from the punk and cartoonist movements of the 1980s and channel your inner poet/visual art activist. No experience necessary, but participants are encouraged to use their local copy machines to publish and spread their creations! 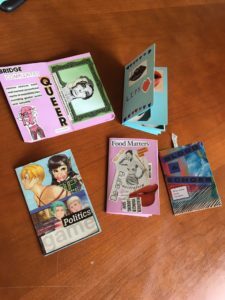 Two members of the Digital Feminist Commons, Liz Polcha and Nicole Infanta Keller, shared the experience they had building a digital feminist community at Northeastern. 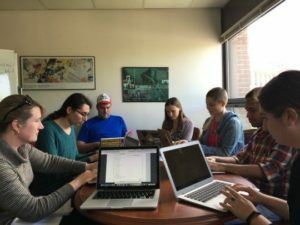 At the conference, they were able to pose the following questions to a larger digital humanities community: How are faculty, graduate students, and staff collaborating together on digital humanities feminist research in the Boston and New England area? How can the digital humanities welcome feminist researchers who may be unfamiliar with digital methods? How does labor affect collaboration in digital humanities feminist research? Find a write-up of the event on our blog, here.